The war was won, the Depression was over, and Americans were back on the road. 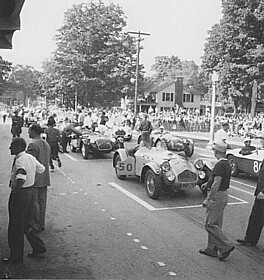 From all across the nation, sports car drivers converged on Watkins Glen to race through the gorges, hills, and village streets of upstate New York. Over the years, the course has evolved from its humble beginnings on streets lined with hay bales to the modern closed track that plays host to NASCAR today. 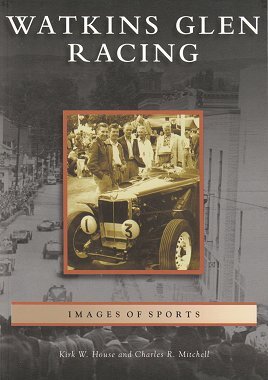 Through vintage photographs, primarily from the International Motor Racing Research Center at Watkins Glen, Watkins Glen Racing chronicles the history of the track with early drivers, like Cameron Argetsinger, Phil Walters, and Dave Garroway, vintage cars, hairpin turns, and death-defying races. A surprising breed of men dared race automobiles in those early years. In the very first race in 1948, the junior prix, one of the drivers was the creator of the Addams Family: macabre New Yorker cartoonist Charles Addams. But the innocence of Watkins Glen was shattered in 1952, when one of the cars brushed into the craning spectators, killing a seven-year-old boy. That was the end of street racing in Watkins Glen. Another race was mounted in the nearby town of Dix in 1953, and then a closed course was built to accommodate the race. Formula One racing arrived in 1961, as Watkins Glen staged what was called the U.S. Grand Prix. Today, it is one of the road course stops on the NASCAR tour. Kirk W. House is the former director of the Glenn Curtiss Museum in Hammondsport. Charles R. Mitchell, a former photographer, is curator of the Yates County Genealogical and Historical Society in Penn Yan. Together they have authored a dozen books with Arcadia Publishing.